Have you ever dreamed of having your wedding on the rolling hills of the Tuscan countryside? Tenuta Canto alla Moraia is the ideal venue for country-chic weddings. 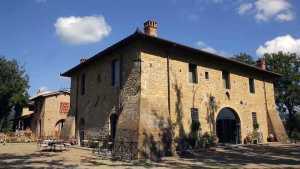 We can organize your wedding here, in the Chianti region, in a unique location: ceremonies with full civil validity and receptions up to a maximum of 480 people. Relax: the entire organization of the wedding will be taken care of by us in a fairytale atmosphere. Two to five hundred people: it will always be an unforgettable event. The civil or symbolic ceremony can be celebrated on the terrace in front of the house or in the garden, at poolside. The reception: you can choose one of the lounges of the Villa or the garden. Catering: We can offer different types of menus created by our chef to make your big day perfect! Villa Canto Alla Moraia is an exclusive retreat in the Tuscan countryside that really fulfils all needs. 5 elegant suites refurnished with great attention to details and style, a fully equipped kitchen and a spacious living room with fireplace and big windows overlooking the Tuscan countryside. The outdoor swimming pool and the gardens are the perfect place where to relax and enjoy the beautiful landscape. The 3 annex houses complete the offer adding extra accommodation options for those traveling with a group of family and friends.